Night High is a visual collaboration between highliner Sarah Rixham and photographer Dora Dc. The film encapsulates the dreamy flow state athlete Sarah Rixham finds whilst floating in untouched space on a one inch wide slackline. She uses the cover of night to explore unique urban gaps in the pursuit of this dream-like state induced by highlining. 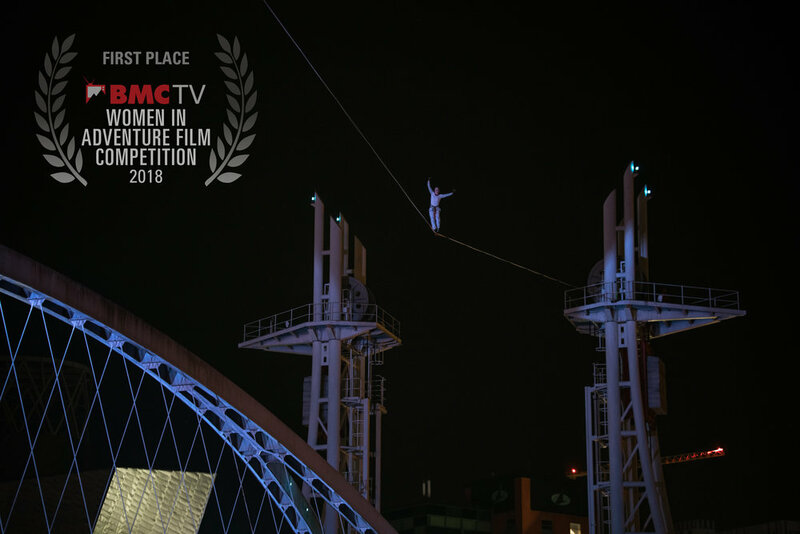 I am really pleased to announce that Night High won the BMC Women in Adventure Film Competition - you can watch it below. Directed, filmed and edited by myself. ''Meeting Sarah at ShAFF in 2016 had a huge impact on my photographic practice; she introduced me to slacklining and shortly after I started documenting the slacklining community and lifestyle. When she approached me about making a film together 2 years later, I knew it was going to be something special. My background is in photography, and Night High was my first venture into producing, directing and editing. It certainly pushed me out of my comfort zone, and I really enjoyed experimenting and feeling challenged. My strength as a visual artist lies in storytelling, which manifests itself across various genres, from fine art to adventure sports. I look up to Sarah a lot as an athlete, and being able to capture her essence in this film was a great privilege. Her mind and body strength are phenomenal, her perseverance - unparalleled.